Keeping an eye out for atherosclerosis symptoms can help you avoid heart attacks and strokes, which are common worries for anyone above 40 years of age. But what exactly is atherosclerosis, and how is it caused? How do you know for sure if you’re at risk? To understand what atherosclerosis is, you’ll have to know how the blood vessels function. Arteries are blood vessels in our body that carry oxygen-rich blood from the heart to other organs. The word ‘Atherosclerosis’ means ‘hardening and narrowing of arteries’, which is exactly what the condition does – it narrows the arteries through deposits along the arterial wall, called Atheromas. 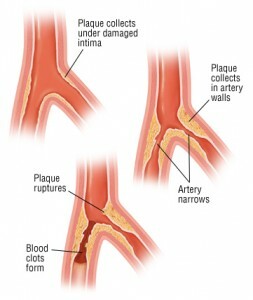 Atherosclerosis symptoms manifest when plaque blocks the arterial blood flow. Atheromas are nodular deposits composed of fat molecules (cholesterol, low density lipoproteins, triglycerides), macrophages (scavenging white cells in blood), platelets (clot forming cells in blood), and fibrin threads (clot forming material in blood). These plaques get deposited in the intima or endothelium, which is the innermost layer of cells in the arterial wall. Such deposits, over time, cause hardening or sclerosis. In simpler terms, the more these plaques are deposited, the thicker the arterial wall becomes, bringing down the elasticity of the artery. This brings about a drop in the blood flow through the same artery, and cuts off the blood supply to the tissues ahead. The symptoms of atherosclerosis depend on the arteries affected and the site of blockade. The arteries that are mainly affected are coronary (heart), carotid (brain), and renal (kidneys) arteries. These symptoms arise when the artery supplying blood to the heart walls gets blocked, causing ischemia (blood and oxygen deprivation) of the heart muscles. It takes years for these plaques to attain a size capable of cutting off the blood and oxygen supply to the heart. Chest pain (angina pectoris) is a primary symptom when blood supply to the heart is reduced. People who suffer from coronary atherosclerosis symptoms are likely to experience heaviness in their chest, along with a choking and smothering feeling. The pain typically lasts for 2 to 5 minutes and may move to the left shoulder. The pain of a heart attack can be identified by its nature – it lasts for a longer time and is not relieved through rest. Once similar symptoms like these start manifesting, doctors are likely to recommend an angiogram procedure, a diagnostic test through which atherosclerosis can be confirmed. An angioplasty is a surgical procedure performed for coronary revascularization, which is essentially the process through which arterial lumen is restored. Under angioplasty, arterial lumen is restored with stents or balloons (the balloon-tipped catheter deflates and pushes the plaque to allow better blood flow in through the artery). Stents are metal wire-mesh tubes to be retained inside arteries in order to avoid arterial blockade. Another form of surgical intervention is Coronary Artery Bypass Graft (CABG). This involves the use of a healthy vessel (artery/vein of the same person’s leg/hand) to reconstruct and bypass the site of the arterial block. How Do Doctors Decide On The Need For An Angioplasty? There are also certain advantages and disadvantages that doctors take into account while choosing the procedure. Angioplasty is advantageous over CABG as it is cost-effective and involves a short hospital stay. The procedure falls short due to the high re-stenosis rate and the poor results it shows for diabetics or three-vessel disease patients. Based on the atherosclerosis symptoms, doctors will be able to prescribe one of these treatment options. This entry was posted in Angioplasty and tagged angina pectoris symptoms, heart disease symptoms by Dr. Harshal Narkhede. Bookmark the permalink.